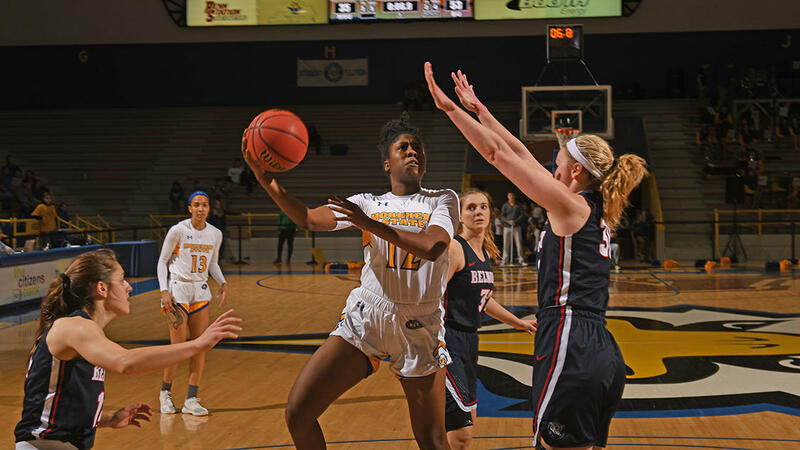 The Morehead State women's basketball team had its eight-game winning streak snapped with a 77-57 loss to the Ohio Valley Conference's first place Belmont Bruins on Saturday afternoon at Johnson Arena. The Bruins (18-5, 11-1 OVC) opened the game with five consecutive makes from downtown and never cooled off as they made 15-of-27 (.556) from beyond the arc to pull away for the 20-point win. Preseason OVC Player of the year Darby Maggard made 6-of-7 from deep and scored a team-high 22 points. Morehead State (18-7, 9-3 OVC) managed to take 19-more shots than Belmont but only connected on four shots from deep, going 4-of-22 (.182). "The three-point shot was the difference today," said Eagles' head coach Greg Todd. "We were unable to run them off the arc and they took advantage of it." Graduate forward McKenzie Calvert paced the Eagles' scoring with a game-high 23 points. Calvert was 9-of-19 from the field with four assists and four steals. Senior Miranda Crockett scored 14 points to extend her double-figure scoring steak to 29 games. The Martinsville, Va., native also nabbed eight rebounds. The Eagles will look to get back on track Thursday when Austin Peay visits. The Governors knocked off Morehead State 81-80 on Jan. 3 in Clarksville, Tenn. The teams are scheduled to tip at 5:05 p.m. ET.